I had this tag basically finished last night, but was way too tired to photograph it and then write the blurb... So I finished today's tag as well. I'm up to date again. And we're half way through. Can't believe how quick the time passes. Anyway today's tag uses the alcohol background (Lettuce & Clover) with the stamped item in Archival ink and then gently rubbed . It removes the ink and the alcohol color. Tim used his seasonal reverse text. I have some of the reverse text stamps, but not the seasonal one. Sigh. So what to do. I decided to use one of my Xmas text embossing folder as a rubber stamp. The text is written in a thinner font style so the finished background is not as pronounced... But as you can see from the detail pic, it did work. Well since the background was really a background I wanted something to stand out. 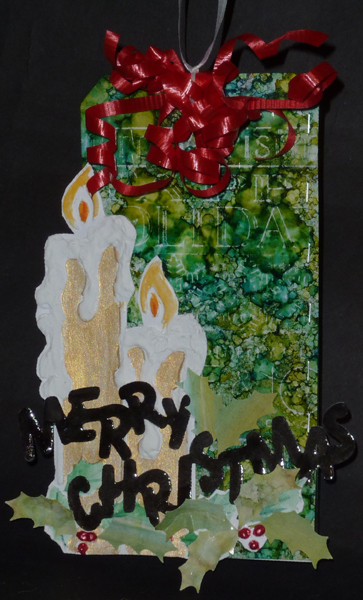 I recently got this folder with the candle design (Craft Concepts "Holly Night") that I really liked. 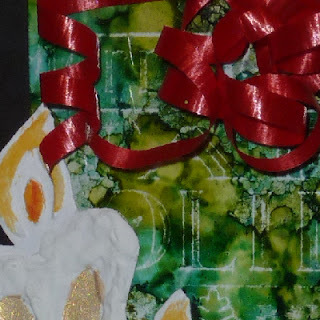 So I embossed it on white cardstock and painted it with watercolors and gold paint. When dry, cut around the design and added Aleene's "True Snow" on the area supposed to be wax run off. It gives a nice textural effect. I cut the words with my electronic cutter, painted them black, and coated them with Glossy Accents (a Jennifer McGuire trick from her online class I took a while back). Punched out some Holly Leaves from alcohol decorated paper I had in my stash using a Punch Bunch large Holly punch. Adhered everything to the plastic background, and then onto a white cardstock tag. Added red Liquid Pearls dots in the leaf areas. Added a bunch of curled red ribbon and a white hanger.